In looking at how and why companies are using technology to encourage customer participation, it is clear that this is a diverse topic, with many different theories. Research suggests that the use of technology in advertising is only advancing as usage becomes more common. In the future, this evolution will change the way people see advertising and how it is to become an intrinsic part of life rather than just a background noise. Encouraging customers to actually become a part of the advertising campaign, to interact, gives them a chance to feel like a part of the company and that their views are important. Tradition would dictate that supply is determined by demand. Products and services would be invented as a solution to a problem or need within society. In more recent times, we have seen advertising become more ‘push’, convincing customers that they need or want a product, buying into a brand or ideology than this outmoded ‘pull’ method. A good example here are things like ice cream Mars bars, after all, there are no recorded instances of anyone burning their mouth on a traditional Mars bar and asking for a colder one. However, the rise of social media has changed things again. The word social is itself indicative of two way communication which James E. Grunig (1984) tells us is the only true method of conversation. This two way interaction means consumers are able to feel a part of the company, especially when a company replies to even the smallest queries posted on their ‘Facebook’ page, not only buying but being part of the brand. The out of home advertising aspect of these campaigns creates experiences which people want to share with others is vital to current advertisements, to be different and stand out. If the people who experienced it told their friends and family, it places a thought and memory into their mind about the brand, a recommendation from a peer can mean all the difference when people are choosing between brands whether the recommendation be good or bad it is able to affect their choices. Simply telling people what you want them to believe, something Grunig would term propaganda, is no longer able to connect with audiences. People multitask while watching TV and do not pay attention to billboards or posters. If people don’t look at them, they do not take in the intended message. Billboards and TV adverts are easily forgotten, today we understand that people will retain more information and knowledge when they are actively participating and able to converse they will learn more. Not only that but Dale’s cone of Experience, Dale (1964) shows that the more stimulus used the better the knowledge retention. Using technology in campaigns creates a whole new experience for the consumer, making it more memorable in the process. Interactivity with a company through an advertisement can not only make the consumer feel like they have connected with the brand on some level it can also help generate brand loyalty. The amount of different technologies that are being used at the moment means not all advertisements are of the same calibre. Comparing a campaign using Bluetooth connections and one using augmented reality is not entirely feasible as they both offer high interactivity levels but can create different outcomes to the campaign. One positive when using technology, especially when using ones such as the Opinionator, is that they allow true interaction results, placing an advert on the TV, you can see how many of the audience had the channel on at the time the advert was shown, but it cannot tell you how many of them were actually watching the advert when it came on. By concentrating on technology which allows near accurate interaction statistics, which allows the company to see how successful it actually was. Some who participate with the advert could also film the experience and share it over the internet, Hypserspace’s campaign for Cadbury’s Crème Egg is a firm example of this with the amount of views the consumer generated videos received on YouTube, this shows the uncontrolled amplification side to unusual advertising techniques that are used, things that the traditional methods of advertising would not gain. Although the aim of the primary-research was to also gain a wide range of views, it wasn’t 100 per cent possible with the amount of people who responded to the questionnaire. While 45 people were enough to gain enough responses to be able to draw graphs from the results, a wider variety would have created results that were more diverse. This would have helped to gain a more comprehensive view of what the general population thinks of advertisements. 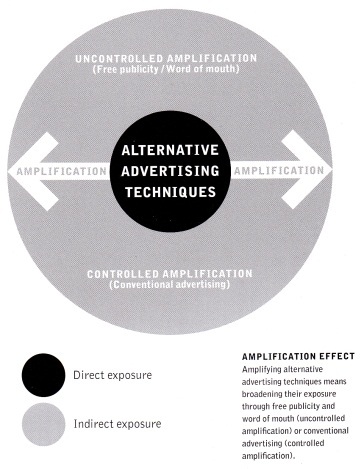 The topic allows for further study, if the research was to be taken further it would be plausible to look more into the psychology of advertisements to find out what the fundamentals are and why the traditional advertisements worked, this would give some deeper insight into why advertisements are changing and why involving consumers works as well as it does. Research into the mechanics of some of the technologies and how they work would also be beneficial to the project by gaining a more thorough understanding of how they work. Not knowing what technology will be available in the future for advertising cut the research short on an expansive matter but as each technology becomes known it would be possible to write further on the topic. It would also be possible to write further and delve deeper into guerrilla marketing, looking further into the history of the movement and the reasons behind it. In conclusion technology is being used to encourage customer participation in an attempt to stand out from traditional methods of advertising and to create a way of reaching out to consumers. Trying to interact with the general public can generate a whole different idea of the company in the mind of the consumer. It can also help companies change their persona to a more welcoming, open personality like T-Mobile now have because of their successful Life’s for Sharing campaigns. Being more open about the company allows people to feel better about letting the company know what they think about them, say, to comment on their ‘Facebook’ page instead of writing on their own blogs, which is where Dell had their trouble. Creating a more memorable experience and actually inviting consumers to interact with the advertisement means it has a higher chance of being remembered, and getting the message across to the audience. Future technologies that are currently in development are unknown; because of this the only technology feasible to be included about future technology is Microsoft’s Kinect motion sensor for Xbox 360. At the moment the main use of this technology is to play games, the sensor tracks your body, making you the controller instead of having to hold onto a controller like when playing the Nintendo Wii or Sony’s PlayStation Move. 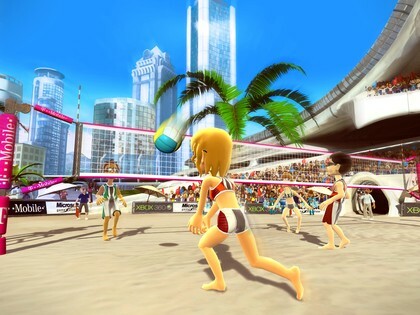 There are a large range of games available for the Kinect, including ‘Joy Ride’, a car racing game, ‘Dance Central’, a dancing game and ‘Kinect Sports’, enabling the player to play different sports like bowling and table tennis. The advertising potential for Kinect is great; with only being released since the beginning of November 2010 it already has companies advertising in its games. Chevrolet bought into ‘Joy Ride’, allowing players to virtually test drive Chevrolets vehicles, also watching video advertisements from the company unlocks new Chevrolet vehicles to drive in the game. T-Mobile are another company who have sponsored in game advertising with ‘Kinect Sports’, including branded sports equipment and large foam fingers held by the audience. There is a large potential for in game advertising, and it is appealing to companies because of the interactive feature of it. It is the opinion of the author that as this technology is progressed further and falls in price; it could be used in out of home advertisements on the street or in shops, whether to play games, or to take over augmented reality in things like the Cisco interactive mirror. Augmented reality is so new that companies are only just starting to bring into the public. The premise of it is so unusual it is becoming more and more popular with new campaigns. Out of all the technologies listed in this dissertation augmented reality is one of the most expensive, Myles Peyton from Total Immersion, the global leader in augmented reality states the average costs being around £35-40k, a lot to invest in a campaign for a company, though large businesses like Nestle have financed AR campaigns. Augmented reality works to enhance the real world, there are thousands of AR capable phones on sale with applications for phones such as the IPhone coming out daily that include augmented reality, for such things as games and even maps using the inbuilt GPS systems to show directions. There are numerous capabilities for AR and it has a huge future potential ahead of it. In 2010 there are 91 million smart phones capable of AR, it is predicted to rise significantly to 197 million by 2012. The technology is not only used on mobile phones, it has been used in stores to promote brands or certain products, and is also used at home. Around 70% of homes own a home computer, and most computers now come fitted with a webcam, something that is vital for AR to work at home. There have been many campaigns including AR recently, one of those is Kit Kat from Nestle who are using AR to help promote their competition to win tickets to concerts James Maxton of Nestle stated that Nestle was the first confectionary brand to use augmented reality on packaging and that they would definitely use it again. The competition is run on all Kit Kat products, but because of the shape of most the only one that could fit the key for the AR experience was the 4 finger Kit Kat, only if consumers bought this particular one would they be able to try the AR experience. 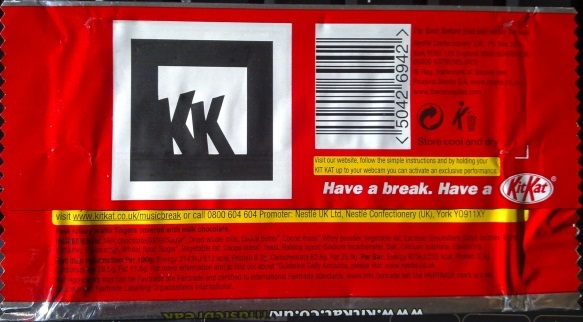 Augmented reality uses symbols (like the box on the Kit Kat) for the AR software to recognise which can unlock anything from games to something more simple like watching a video, Nestles AR campaign includes UK group Scouting for Girls performing on theKit Kat when held up to the webcam when visiting the website. Augmented reality has proven popular with consumers; one of the best examples of an augmented reality campaign is ‘I Am Iron Man’ for the release of Iron Man 2 in cinemas worldwide in May2010. 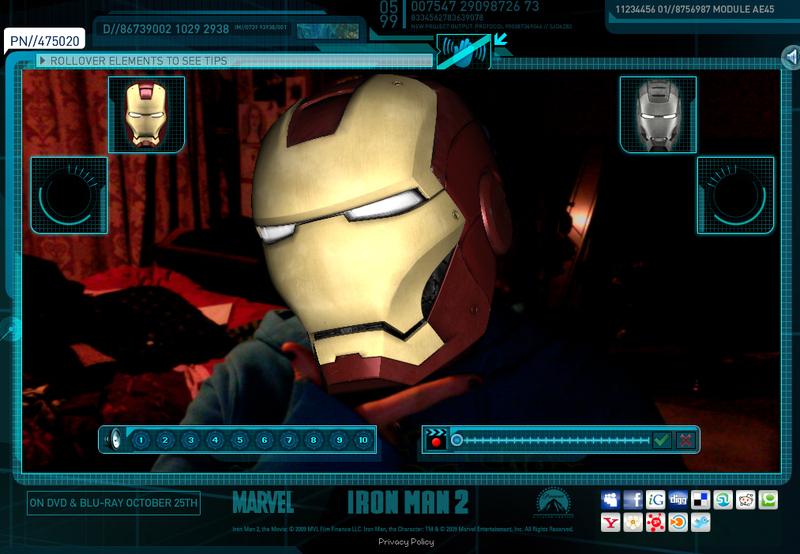 Total Immersion created the campaign for the film which included using your webcam, choosing between characters ‘Iron Man’ and ‘War Machine’ and being able to see yourself with their helmet on. The effect of the augmented reality makes it look like you are actually wearing the helmet wrapped around your head on the screen, and not just a 2D image. The campaign received 750,000 visitors in the first few weeks with users spending an average of 2 minutes experiencing being ‘Iron Man’. It has been debated as to whether will hold through to the future. There are different levels of AR that can be used though, the mobile applications are most definitely going to remain and get better, and as technology gets more advanced campaigns will be able to find new ways to use it. Not only this but shops using it to create a better experience for consumers. Lego have created a very effective use of AR with their products. When buying Lego Technic, and screens were made available, if the packs were held up to them they showed the model that the package held in full 3D size, making it easier to understand what was being bought than only having the images on the back of the box. Since they included AR on their packaging sales intent and sales have increased for Lego Technic. Andrew McCormick from Marketing Magazine (2010 page 15) writes of a technology using AR being developed by Cisco, a mirror for fashion outlets that allows customers to view themselves wearing clothes virtually, without actually trying them on. He states figures that show the vast future for AR, the total spend in 2010 on AR reaches to £13.6m, a high figure expected to reach £204m by 2014 showing the faith in the technologies future. They allow a number of different choices for the consumer to watch, from the trailer of a film, facts, characters of the film or other things more exclusive to the product or film advertised. Buena Vista hired a number of the Showscreens to promote their films Hitchhiker’s Guide to the Galaxy and Sin City (see appendix 19 page 82). 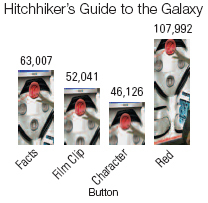 Hitchhikers Guide to the Galaxy received 269,163 interactions over 34 days. The posters results shows the nations curiosity as well as the campaign included a red button that said ‘don’t push’ next to it, and as shown in the results that button gained the most pressed out of all the other buttons. Because the Crème Egg is only released during Easter the campaigns need to be noticed, the touch screens were not the only way that Cadbury advertised the Crème Egg, but as Jodie Bates says it amplified the rest of the campaign elements. The research also found that people found that digital screens were ‘a good idea’, that ‘movement on the screen catches my eye’ and the screens are ‘informative’ and ‘entertaining’. The research constructed by the OAA has backed up that digital is a good way to advertise and that people do pay attention to these types. It was also found that people would like to see more digital screens about. Digital screens allow advertisements to be changed at any time which means it is not the same advertisement being displayed for days on end like with billboards. Sound used in posters is also another simple technology in advertising, but it can be used in many different ways. Instead of the usual image on a bus stop or poster, those including this technology can actually ‘talk’ to the consumer. 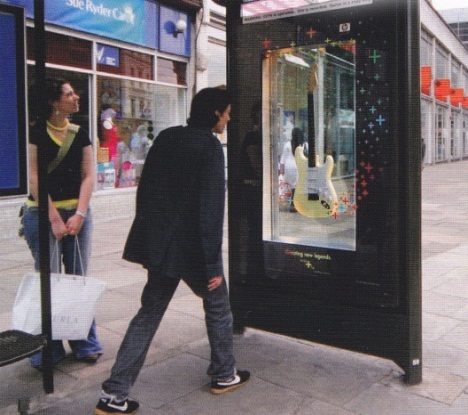 Motion sensors placed within the advert are popular; it means that the poster is not talking when no-one is there and also means when someone does move in front of it, it has the ability to make them wonder where the sound is coming from, making them actually look at the poster and pay attention. Some offer slightly more interaction than just those with motion sensors, the image on the right is a bus stop advertisement for Hewlett-Packard. The competition the advert was for was a chance to win a Fender guitar, one of which were actually encased in the adverts. It played guitar solos at regular intervals, while buttons on the advert allowed people to choose to listen to other guitar solos. The campaign might have gone well for the company, but by the end of it four of the Fender guitars had been stolen. 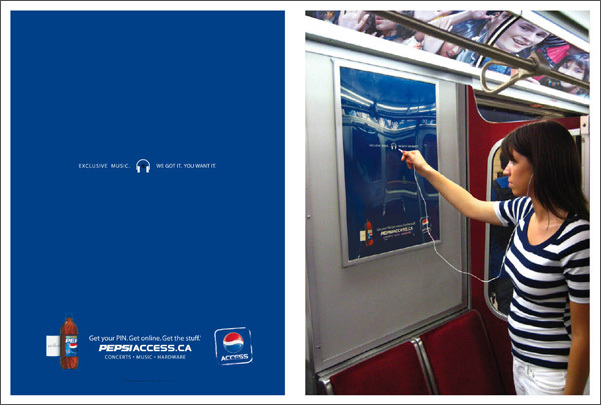 Sound doesn’t always have to come through the poster out loud BBDO created a campaign for Pepsi in Canada for Pepsi Access, a competition that had every bottle of Pepsi had a PIN number under the label for customers to redeem them for exclusive offers. The posters were created for the Toronto and Vancouver subways, targeting commuters. The posters had a headphone jack embedded into it, allowing people to simply plug their own headphones into the poster and listen to one of 12 music tracks that the posters play. There were over 100 posters released on the underground, using the underground was a good tactical decision as people are generally bored upon travelling, allowing them time to study the poster and having time to listen to a track. Sound is one technology which has been used in further technology adverts, the touch screen games and such can also employ sound, making the experience for the commuter to come together. If companies want to try something different but keep the cost of the campaign down sound posters is one of the cheapest technologies that can be used in adverts other than Bluetooth. Bluetooth was created in 1994 and has increased in popularity as the easiest form of transmitting data from phones or computers. It was created by Ericsson who creates phones for Sony; it’s a wireless technology and can either be used to send data or can also enable phones to become remote controls for Bluetooth enabled computers via radio transmissions. Bluetooth is one of the simplest technologies that are used in advertisements. Infrared technology was the first technology used, but Bluetooth has taken over for its use of only having to be near the sending device, whereas with infer red it had to be pointed in one direct area; infrared is generally kept to television remotes now. 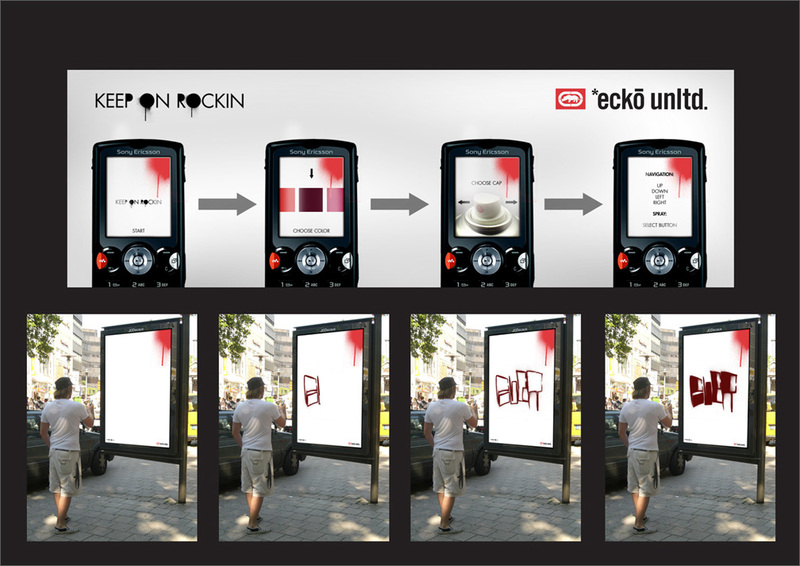 This advert for Ecko Red was created by Benjamin Busse (2007), it used Bluetooth to allow passers-by to connect to the advert, choose a colour and spray can top and create their own graffiti on the LCD screen integrated in the citylight just by using the cursor on their phone. Bluetooth in posters can also allow the consumer to download content from the poster. Hypertag is a company who specialise in media advertising such as Bluetooth, they have been asked to create many different campaigns for various companies. They created a poster campaign for the UK film Shaun of the Dead, enabling customers to accept a download from the poster of a ringtone of moaning zombies and even wallpapers from the film. Bluetooth is recommended to always be turned off when not in use because people can send things to your phone anonymously and it could be a virus, but with these posters consumers actually have to connect with the poster by themselves so the advert is not invading their privacy. Much like the idea of the girls talking to men in clubs about their favourite drink, Hypertag have created wearable Bluetooth marketing products, for people promoting merchandises it allows them to just be close to people and let them know to turn their Bluetooth on to receive free content for their phones.